This ECG is from a man in his 60s who presented with chest pain on a background of stroke and hypertension. This was the initial ECG. 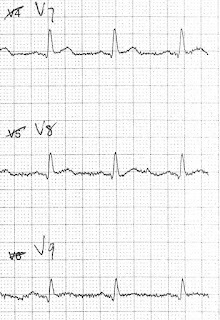 This ECG shows ST depression in V2-3 and ST elevation in posterior leads V7-9 (leads labelled V4-6) due to posterior MI. Right precordial ST depression in a patient with chest pain. Posterior leads.